Group exhibition hold everything dear at Grace Cossington Smith Gallery Opening 2-4pm Saturday 18 May Deborah Burdett, Mandy Burgess, Michelle Belgiorno, Michelle Connolly, Renuka Fernando, Tilly Lees, Jo Meisner and Ro Murray. Ro’s Artist talk at the BigCi open day. #keepitintheground at the Miners Hut, Katoomba. Ro and Mandy Burgess start Factory 49 calendar with their installation sort it out Opening 6-8pm Wednesday January 30. The collaborators extends the act of making into a challenge to document the content of their yellow bins. They playfully approach sculpture using discarded rural metal fragments to make seven symbolic open vessels. Their process-oriented constructions are drawings in space. The collaborators have been accepted finalists with Fortress for the North Sydney Art Prize, the Coal Loader Site at Waverton, opening 2 March until 17 March. ‘Fortress’ is a mini forest of seven dead trees with yellow wooden tree collars as a stark reminder that the environment needs protection from the damaging effects of man-made climate change. There will be more frequent and extreme temperatures and winds which will cause devastating bushfires, droughts and cyclones. 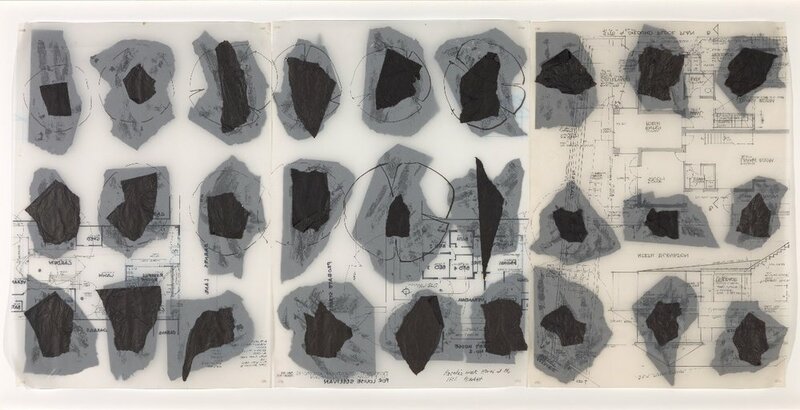 2018 had an exciting finish to the year for Ro with works on her dead-filed architectural negatives selected for several art prizes. Following her Solo exhibition at Factory49, Ro continued to develop her red and black geometric series. #liddell acrylic mural on marine ply (five panels), 240x600cm, carpark of Look Printing, Albion Street Leichhardt. Exciting new exhibitions and art prize in August/September. I have an OPENING 6-8pm WEDNESDAY 1 AUGUST, dual exhibitions of my geometric series, in the Office Space and on the Outside Wall at Factory 49. Otherwise come and see me in the Gallery 1-6pm Thursdays. 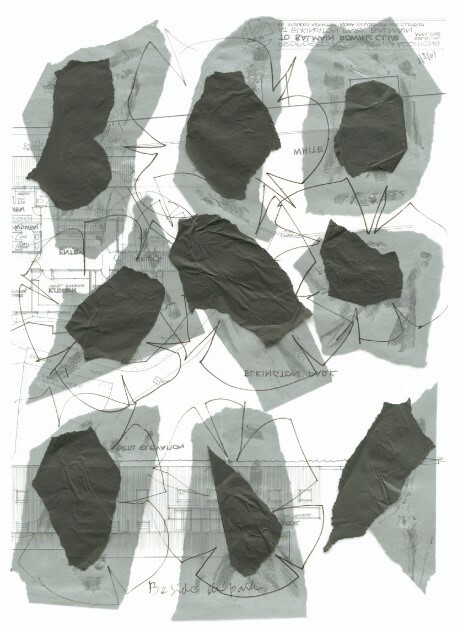 Here and There is a series of collaged tissue paper on my architectural negatives OPENING 22 AUGUST at Home@735. Three are tracing paper and three dye sublimation prints on aluminium. Part of this series is the triptych Midden, which was selected Finalist for Marie Ellis Prize for Drawing 3-17 August, Queensland College of Art, Griffin University, Brisbane. Chrissie Cotter Gallery group exhibition “A Little Death” with Elizabeth Rankin, Kirsten Drewes, Ro Murray and Mandy Burgess. OPENING 6-8pm WEDNESDAY 5 SEPTEMBER, until 16 September. Unfortunately, I will be away for this show, but it will be worth seeing. “What were they thinking” acrylic on plywood, wall installation 2.4x3.5m at Factory 49. Following my exhibition in April at Factory 49, I have been asked to join the Management Committee. With another wall work installation to be part of the group exhibition opening 20 May until 2 June, 49 Shepherd Street Marrickville with some fellow committee members Molly Wagner (molly_L_wagner), Jac Fontaine(j.font.art), Tara Lyubicic (taralyubicic). Watch my interview with Edward Steele. 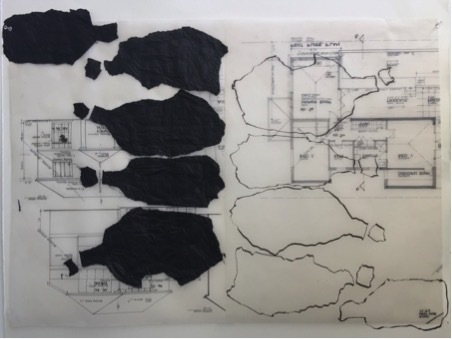 Ro’s new body of work, The Architects Negative, lino prints on her dead filed architectural plans was part of the group exhibition INHABITED ARCHITECTURE at Chrissie Cotter Gallery, sponsored by Inner West Council during March. Fellow artists were Susan O’Doherty, Mandy Burgess, Freya Jobbins. The lots of Art Prize selections for April and May for Ro: Section CC for Wyndham Art Prize and Swan Hill Print and Drawing Prize in Victoria. And the Murray Burgess collaboration: Sculpture at Scenic World and Sculpture Other in Katoomba. THE TWINS was included in the Sydney Story Factory auction if you can tell a story… 2017, which raised $80,000 to run writing programs for kids across Sydney. The response to The Twins “You can hear everyone screaming at the horse at the grand ball. It’s hilarious” - James from Woolloomooloo. Or death to the plastic drinking bottle, a homage to the thousands of plastic water bottles that go to landfill or are dumped in the ocean, on one of my dead filed architectural drawings from a past life. Over October Ro and artists Jane Gillings, Dean Sewell and David Cragg, were featured in the public art exhibition ART FOR THE PLANET at Darling Quarter, curated and produced by aMBUSH Gallery. Ro’s work sort to expose the ongoing and often hidden destruction of wilderness areas caused by long wall coal mining. The sculpture/paintings Banksia sculptorii and Araucaria explorii , oil on plywood, are a fusion of human and tree. They represent Rae and Yuri Bolotin, whose property is opposite Wollemi National Park, adjoining the Garden of Stones National Park. 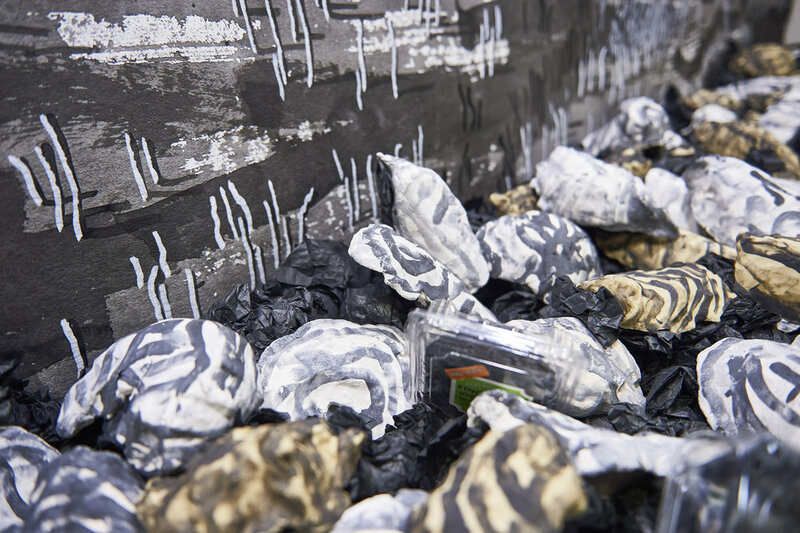 And the river ran black…a work of mixed media on paper – features drawings that interpret Yuri’s mapping project , where notable landforms in the garden of stones is given a presence by naming them, to help preserve this world Heritage Wilderness from destruction. Coves, Cliffs and Creeks was a solo exhibition commissioned by Willoughby City Council for their Foyer Space to coincide with Willoughby Visual Arts Biennial theme of Kaleidoscope over September 2017. My installation investigated the remnant bushland of the western coves of Middle Harbour, from two perspectives—from the land and from the water—imagining a time before twentieth century development. I explored the area on foot and by boat gaining different views. From above on the rocky headlands where jagged patches of water were glimpsed distantly through branches of trees. And down on the water, enclosed by fallen rock boulders and looming hills of trees, were tidal mangrove forests along the creeks, rock shelters, middens and fish traps and plastic debris. Over the years (last century) I had ventured into Middle Harbour. In my past-life as an architect I had a few commissions for house additions on large steep, sloping blocks with angophoras and rock boulders. I had followed the winding roads to the addresses for design, but never explored beyond, until an invitation to go out on a boat that was moored in a remote cove. The sailing was more like drifting and I recall the tree-clad hills with no houses. Years later, and more regularly from another boat moored at Sailors Bay, I became more familiar with Middle Harbour. Since then (this century) with a hired kayak from The Spit I discovered the mangrove forest at high tide of Crag Cove. This year I revisited walking these coves. From the lookout at Harold Reid Reserve, I followed the Foreshore Track north and then down onto the mud flats, to what I call Leech Creek, following a lightly marked path at low tide amongst the mangrove shoots. The Foreshore Track continues around North Arm of Castle Cove, to Explosives Reserve, the most north of my bushland investigation. Another discovery south, on a pocket of waterfront bushland was Clive Park. Sitting on a large flat rock looking north-east, I could see up Middle Harbour to the ridge of Forestville. Seeing oysters below on the rocks, I climbed down and discovered the rock shelter under the large overhang above, and the middens from the original caretakers of this place. Ro coordinated eleven artists in a group exhibition “Another Perspective with Paper” at Grace Cossington Smith Gallery Wahroonga during July. The artists were Mandy Burgess, Marguerite de Fondaumiere, Wendy Edwards, Renuka Fernando, Lisa Giles, Tilly Lees, Pamela Leung, Jacqueline Maureira, Ro Murray, Mirra Whale, Lisa Woolfe, and curated by Christiane Keys-Statham. Willoughby City Council as part of the Willoughby Visual Art Biennial commissioned a new work by Ro for an installation in the Council Foyer, on view over September. The installation Coves, Cliffs and Creeks is drawings and sculpture in the two glass cabinets, the wall and the glass Entry Doors. As part of the art health program at the cancer clinic, Ro undertook a three-week art residency with Arterie over June 2017, painting on the glass walls around Chris O’Brien Lifehouse. The project is a development of her project PROFILE2050 at RPA Hospital last year, where Ro profiled by marker pen eighty-one people on glass, Portrait1952 profiles forty-five people in acrylic paint, with the first letter of their name and year of birth. This group exhibition with Murray and Burgess, Deborah Burdett, Susannah Williams, and Renuka Fernando at Chrissie Cotter Gallery in Camperdown end of April was a development of their work from their exhibition The Waiting Room at Articulate Project Space. Murray and Burgess continued their development of home/homelessness with Passage. A labyrinth of spaces, lightly screened off with green fabric, strangely connecting to the tennis courts outside the French doors. With thanks to Inner West Council for their sponsorship. Two more outside installations by Murray and Burgess. The hydro stone figures The Battlers, who represented the women who saved Kelly’s Bush at Hunters Hill from development, and the first green ban, was selected finalist for Harbour Sculpture at Clarkes Point Woolwich in March. also selected was Ro’s work Araucaria explorii, a painted plywood silhouette of Yuri Bolotin, the conservationist for the Garden of Stones National Park, for the Inside Works exhibition. The cluster of nine women and four children was also selected by Inner West Council for Art on the Greenway, on Hawthorn Canal near Lilyfield Bridge, appropriately amongst the trees by the water. March is a busy month for Murray and Burgess with the installation of new works on the harbour. The biennial North Sydney Art Prize is at the Coal Loader Centre for Sustainability at Balls Head - opening 11 March. Murray and Burgess were selected finalist for the stacked hydro stone hands We are all the Same. Ro’s eleven painted silhouettes No Place for Children is also a finalist, installed in the tunnel. This is an exciting place to explore with works in the newly excavated chambers of the adjoining tunnel. Daily 10am - 5pm, 11 - 26 March 2017. 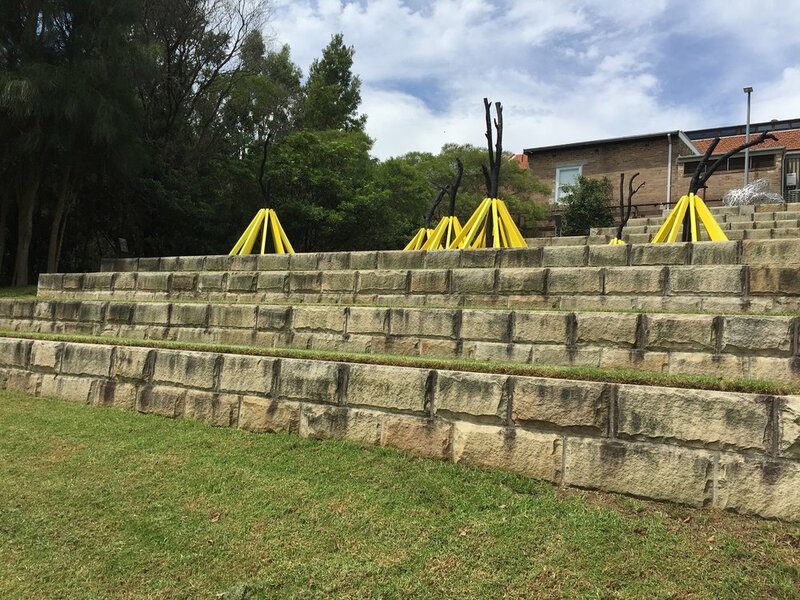 Come visit Harbour Sculpture at Clarkes Point Reserve Woolwich to view Murray and Burgess' new work The Battlers in the trees and homesweethome in the Deckhouse. Ro’s work Araucaria explorii has also been selected. Ro will be on site 11.30am-3.30pm Saturday 1 and Sunday 2 April. The exhibition runs 16 March - 2 April 2017. Murray and Burgess testing green fabric for The Battlers. Read this about this land mark ruling. Ro and Mandy coordinated a group exhibition The Waiting Room 3-19 February 2017 at Articulate project space with fellow NAS Grads Deborah Burdett, Renuka Fernando, and Susie Williams. Bridging by Murray and Burgess develops further the concept of home/homelessness, with regard to waiting in offshore refugee detention centres. My plywood profiles have developed as landscapes through paint and truncation. Araucaria explorii 2016 started with the figure of Yuri Bolotin the co-director of BigCi, during my artist residency November 2015. Yuri explores names and records The Gardens of Stones. The work was developed for Harbour Sculpture at Woolwich 16-26 March, installed inside at the Deckhouse. Also was selected the canvas framed homesweethome by Murray and Burgess, and our hydro stone figures The Battlers, a work in progress. The diptych Wollemia vanessii 2016 also started at this residency at BigCi. The documentary film maker Vanessa Macedo was the winner of the Environment Prize at BigCi. Vanessa made a short advocacy film for the conservation of the Garden of Stones against coal mining. The hydro stone hands by Murray and Burgess have been refigured to We are all the Same at North Sydney Art Prize at The Coal Loader Site for Sustainability at Balls Head. Opening Ceremony 2pm Saturday 11 March. Also selected is my installation of eight figures No Place for Children. Diptych Wollemia vanessii 2016, oil on plywood, has been accepted for a group exhibition RENEW at Chris O’Brien Lifehouse 21-25 November. The exhibition showcases the importance and connection between art & health and coincides with the symposium being held on Thursday “exploring the essence of patient centered care.” This work will be part of Articulate project space group exhibition “What Next” 10-26 December. We are all Strangers (collaboration with Mandy Burgess) was selected finalist for Sculptures in the Vineyards, can be seen in the poplar groveat Stonehurst Vineyard. Despite no funding there were great installations by Akira Kamada, Billy Gruner and Greer Taylor at Undercliff Winery, and Fiona Davies in the Forge, amongst others at the five sites around Wollombi. We are all Strangers (2016) installed at Sculptures in the Vineyards. Girl in the Bark Hat I and No place for Children are selected finalists into Blacktown Art Prize, Opening 2 December. 2017 kicks off with a new group exhibition - The Waiting Room - at Articulate Project Space opening 3 February 2017. Artists include - Mandy Burgess, Deborah Burdett, Susie Williams and Renuka Fernando.